Back when I was a kid, there was no such thing as fall baseball. You played until mid summer and sat around the rest of the summer, bored, half-wishing for school to start. Many years later, during my misspent early 20's, I was no longer playing hardball. I was living in Chicago at the time and started playing softball for the company team. By the next summer, I was playing for three different teams. When that second summer season ended, I was introduced to the concept of Fall Ball for the first time and kept right on playing through October for two of the teams. I remember sitting on the bench, teeth chattering and listening to the Blackhawks hockey games between innings. I also remember snow falling during one especially cold night game! Nowadays, Fall Ball is the norm in many areas - both for hardball and softball. Unless you're down here in Florida like I am now, I'd seriously think about weatherproofing yourself - something I learned to do during my second season of Fall Ball. It may not seem that cold right now, but wait until mid October - especially if you're playing night games. You'll be glad you took my advice and equipped yourself properly! The majority of body heat is lost through your head, hands and feet. Now, I'm certainly not going to advocate wearing a ski mask or converting your baseball cap to a hat with ear flaps to keep the heat in. There's only so much ridicule I'm willing to endure and besides, we're talking Fall Ball here - not Snowball! Even a knit beanie has a little too much of the "dork" factor for me to consider wearing one - at least anywhere but in the dugout. I don't recall my feet ever getting especially cold. Throw on some white woolies if you think that'll be a problem and you should be fine. Your hands, however, are essential to every aspect of the game. In cold weather, a gloved line drive can really sting and there is nothing quite as jarring as the sting you feel from a batted ball during especially cold weather. As great as batting gloves are for keeping your hands warm for batting or fielding a hot shot, they aren't the greatest thing in the world to wear on your non-glove hand. 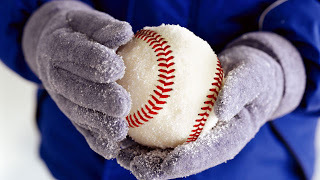 In the cold, a batting glove gets slippery and that's the last thing you want when you are throwing a ball. If it is ridiculously cold, there are gloves made specifically for throwing. The Under Armour Men's ColdGear® Team Sideline Glove is constructed to provide warmth without sacrificing flexibility. Its UA grip treatment creates a tacky feel that helps you get a decent grip on the ball. I recommend practicing while wearing one until you get used to it, though. Most of the time, I prefer using a small, portable hand warmer instead of a special throwing glove. Just hold onto it between pitches and your hand will be plenty warm enough to make accurate throws. Heatmax HotHands® Hand and Body Warmers are fantastic things to throw in your back pocket. These 4 by 5 inch disposable little warmers are air activated and last for up to 18 hours once they are taken out of their individually sealed packages. They come in boxes of 40 - enough for the whole team for several games - and they last for six years in case you want to keep the whole box to yourself. Obviously, if it's especially cold, you're going to need to keep your body warm. Jackets and sweatshirts are too bulky, can severely restrict your motion and even slow you down. I prefer wearing a fitted long sleeve crew designed specifically for cold weather athletes. Both Nike and Under Armour have great solutions that will keep your body warm but still give you plenty of flexibility. A hand warmer, cold weather batting gloves and fitted torso and leg wear will keep you warm enough when you're on the field. Once you get used to wearing them, you'll be as good in the fall as you are in the summer and nearly as warm, too! Of course, you can always throw a jacket on when you're on the bench. Having a portable heater in the dugout isn't a bad idea at all, either!